The Mazda3 is a good car. It’s priced very well. It performs well. It drives well. It’s built well. It’s comfortable. And, it’s a good looking little car. The MazdaSpeed3 is even better. So, expectations were high for the all-new 2014 Mazda3 leading up to its recent reveal in trendy Chelsea neighborhood of Manhattan. With what we’ve seen so far, the 2014 Mazda3 does not disappoint. Mazda re-worked the proportions of the Mazda3 for 2014. It has a 2.4 inch longer wheelbase, but the whole thing is 1.8 inches shorter than the outgoing model. It’s wider, too, at 70.7 inches. The driver and friends have plenty of space inside. Rear leg room is 35.8 inches and shoulder room is up to 57.2 inches and 54.4 inches front and rear, respectively. Speaking of inside, the 2014 Mazda3 is fitted with a new Active Driving Display, a pop-up panel that puts essential info like speed and navigation instructions directly in the driver’s line of sight just above the instrument cluster. There is also something called the Human-Machine Interface which uses the heads-up cockpit concept to help drivers maintain posture and concentration. I imagine it’s like having a strict grade school teacher smacking you with a ruler whenever you slouch. But, it’s probably nothing like that at all. According to Mazda, the HMI divides relevant driving info into groups which is laid out to allow the driver to focus on the road while still taking in the peripheral information. Infotainment-wise, you get the requisite Bluetooth connectivity, sound-system with internet app capability and optional Bose premium sound-system with Centerpoint surround sound. This is all nicely ensconced in a choice of cloth (Black, Sand), leatherette (Black) or leather (Black, Almond) interior trims. 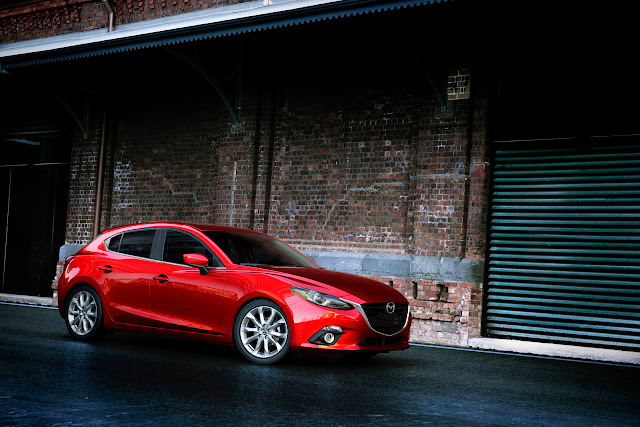 Outside, the 2014 Mazda3 makes the best use of Mazda’s KODO design language yet. 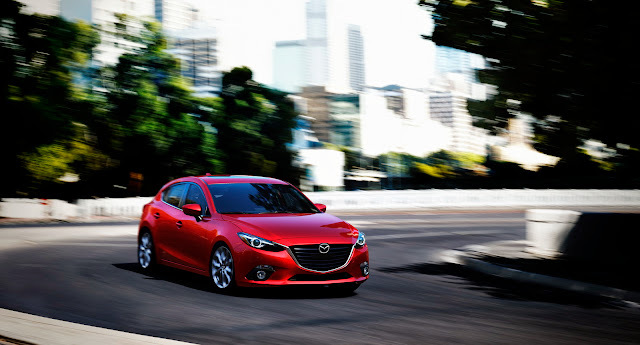 The design isn’t just a pretty grille, the 2014 Mazda3 has the best coefficient of drag in its class, 0.275 (five-door) and 0.255 (sedan). That slippery-ness is due partly to a very cool active grille shutter which opens and closes as needed to balance engine airflow and resistance. Open the hood and you’ll find a Skyactiv-G 2.0 liter gas engine producing 155 horse and 150 pound-feet of torque. Pony up a few more dollars to get the optional 2.5 liter Skyactiv-G with 184 horse and 185 pound-feet of torque. In both cases, the 2014 Mazda3 is fitted with either a six-speed manual or six-speed automatic gearbox and the optional i-ELOOP brake regeneration system which uses the brakes to generate the electricity needed to power the electronics. 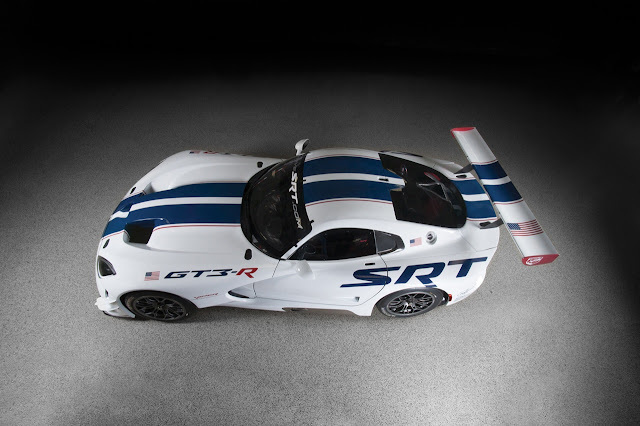 The whole car has a lower suspension, is 30 percent stiffer than the outgoing model and is 200 pounds lighter. This combined with the wider stance, longer wheelbase and shorter overall length means this Mazda3 should be plenty zippy scooting through the turns. Expect pricing, performance figures and EPA fuel ratings to come a bit closer to release time. Until then, take a look a the press release below for all the info and enjoy the gallery. It looks like the 2014 Mazda3 is still a very good little car. 2014 Mazda3 i Touring four-door with SKYACTIV-MT starts at $19,595. 2014 Mazda3 i Touring five-door with SKYACTIV-MT starts at $20,095. i Touring Automatic Transmission Option: $1,050. i Touring Model Touring Technology Package: $1,600. 2014 Mazda3 i Grand Touring four-door with SKYACTIV-MT starts at $22,745. 2014 Mazda3 i Grand Touring five-door with SKYACTIV-MT starts at $23,245. 2014 Mazda3 s Grand Touring four-door starts at $25,995. 2014 Mazda3 s Grand Touring five-door starts at $26,495. NEW YORK (June 26, 2013) – The all-new 2014 Mazda3 compact five-door was revealed to the world today during an event in Manhattan’s Chelsea neighborhood. After weeks of media speculation and numerous “leaked” images of enthusiast renderings, Mazda North American Operations (MNAO) pulled the sheet off the highly-anticipated redesign and confirmed the car will be on sale this fall. The all-new Mazda3 is engineered with the full complement of SKYACTIV®1 technologies – a proprietary suite of fuel-efficient, performance-driven components and manufacturing philosophies – as well as the handsome styling of the KODO design language. Other launch events also were held in Melbourne, Istanbul, St. Petersburg and London to debut the new vehicle, as well as celebrate the 10th year of Mazda3 production. Lower and leaner than its predecessor, this third generation Mazda3 shares almost nothing with its older siblings other than a name. 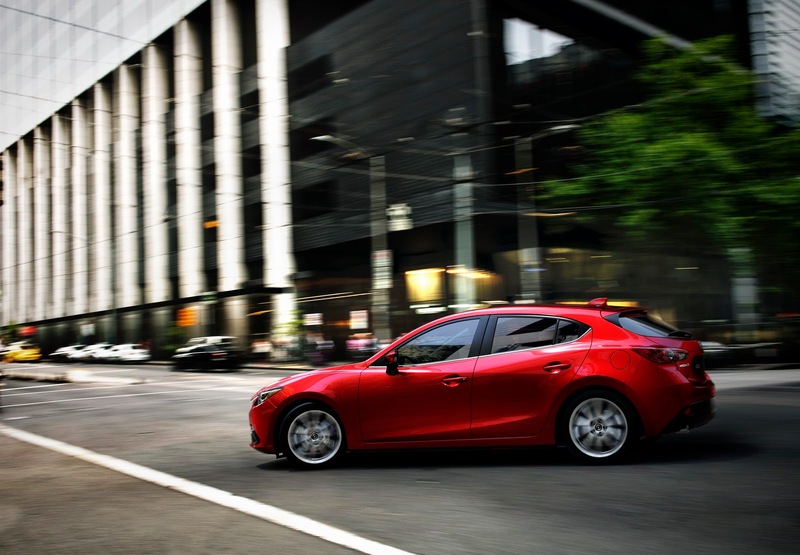 All new from the ground up, the 2014 Mazda3 sits on a wheelbase of 106.3 inches, which is 2.4 inches longer than the previous generation, yet the five-door is 1.8 inches shorter in length at 175.6 inches. With a height of 57.3 inches and a width of 70.7 inches, the Mazda3 reduces its ceiling by 0.6 inches and gains 1.6 inches in the hips while retaining similar headroom space and offering rear legroom at 35.8 inches. The rear seatbacks are nearly 2.0 inches taller for added passenger comfort. Front and rear shoulder room also has increased to 57.2 and 54.4 inches, respectively. This efficient use of space is wrapped in the increasingly striking dimensions of KODO, Mazda’s “Soul of Motion” approach to designs that exude emotional proportions and refined strength. Whether equipped with the standard 16-inch full-cover steel wheels or higher trim-equipped 16-inch and 18-inch aluminum alloy wheels, each set expresses dynamic motion from hub to rim. 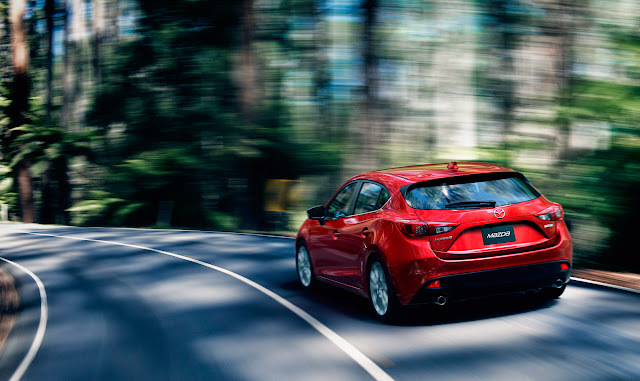 The Mazda3’s cab rearward posture and raked profile further emphasize agility and speed. From the dynamic signature wing of the five-point grille to the expansive sheet metal cresting over sleekly slanted headlamps, from the wide-stance muscular fenders to the taut character lines flowing from panel to panel, sculpting into a chiseled rear featuring provoking taillights, KODO begets the Mazda3 a presence unlike any other. Yet such style is not without purpose as the five-door and sedan models achieve best-in-class coefficient of drag (Cd) at 0.275 and 0.255, respectively, when equipped with i-ELOOP and an active grille shutter. A new-to-Mazda feature, an active grille shutter is mounted in front of the radiator and automatically opens and closes in accordance with driving conditions to improve aerodynamic performance while contributing to real-world gains in fuel economy. 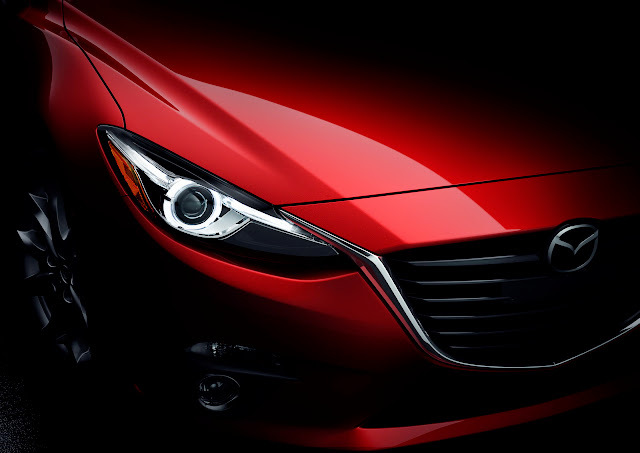 To be available in eight colors, including the premium metallic finish Soul Red Metallic, two all-new Mazda hues are introduced with Titanium Flash Mica and Deep Crystal Blue Mica. The interior is no less impressive, starting with the driver-oriented cockpit. The pedals have been laid out symmetrically to the left and right of the driver’s center-line with a hinged organ-type accelerator pedal as standard for added safety and comfort. Designed not only to appeal to the senses, each control and function also is specifically placed with intuitive utility in mind. The less time spent focusing on adjusting knobs and tapping touch-screen commands, the more time a driver is engaged with the actual act of driving, being alert to what is on the road ahead and, therefore, being able to react quickly, accurately and safely. For added precision, the base of the A-pillars have been repositioned 3.9 inches rearward to afford greater range of vision for both the driver and front passenger. The outside mirrors also are mounted onto the doors instead of the base of the A-pillar to expand the scope of visibility when looking over mirrors from the driver’s seat. All-new for Mazda vehicles and being launched with the 2014 Mazda3 will be a next-generation human-machine interface (HMI) system. Based on the heads-up cockpit concept, the new HMI system aims to help drivers maintain proper posture, concentrate on the road and drive more safely, even while handling larger amounts of information. The information used is divided into groups, and an innovative screen layout is employed to let the driver safely balance the primary job of driving with other peripheral information. 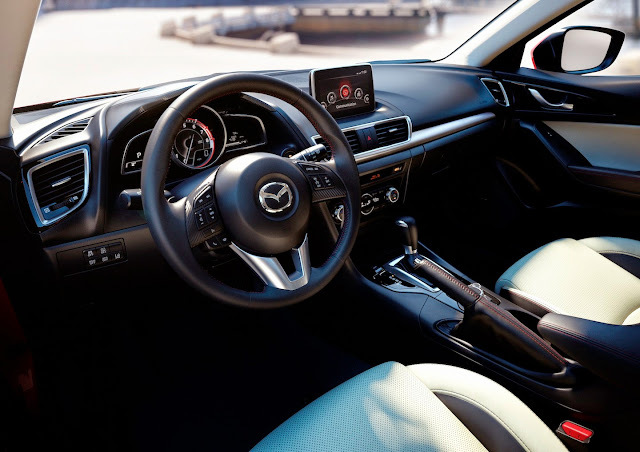 The 2014 Mazda3 also is the first vehicle to feature Mazda’s all-new Active Driving Display, a clear pop-up panel that displays vehicle speed, navigation directions and other important driving information, and is vertically mounted behind the meter hood. This feature not only places necessary information comfortably in the driver’s line-of-sight but also directs the display beyond the instrument panel, more in line with where a driver’s eyes are naturally focused. The Active Driving Display panel will automatically fold back into a hidden position when the ignition is shut off. The redesigned meter cluster features a centrally positioned analog gauge flanked by a pair of wing-shaped digital displays. The dial face for the center gauge is characterized by three-dimensional metallic numerals, evidence of the design teams’ attentiveness to detail, while its red-ring border pulses as soon as the driver’s door is opened, a nod to the vehicle’s inescapable sporty DNA. From the gauge clusters extends a decorative dash panel finished in satin chrome with piano black trim pieces adorning select areas of the center console and front door inserts. The seat architecture has been redesigned with added focus on comfort and space, while at the same time reducing weight. For example, the front seat backs were further sculpted to provide rear seat passengers more knee room than the previous generation Mazda3, and shoulder room for all passengers increased as well. Additionally, the driver’s seat cushion was made larger, while still optimizing the seat back to create a more natural seating position with ample lateral support, a welcome adjustment for those prone to long drives. Available in cloth (Black, Sand), leatherette (Black) and leather (Black, Almond) seat materials, the multitude of exterior and interior color combinations and accents further showcases the attention made to the finer touch points and to the varying degree of consumer preferences. Mazda’s infotainment system receives its own sort of overhaul as well. With the increasing popularity of smartphones and tablet computers, lifestyles, and subsequently driving habits, have changed. To ensure that consumers can continue to be connected in real time with their online community regardless of where they are, Mazda has developed is new operating system to be intuitive and less distracting, which leads to an overall safer and more pleasurable driving experience. The new operating system connects via Bluetooth® to a smartphone and can easily be updated to ensure users always have access to the latest features and services without the need to swap out hardware. In addition to the current music access points via standard AM/FM radio, CD and USB/auxiliary port connections and premium content such as Sirius® Satellite Radio, new features such as internet-based apps Aha by HARMAN™ will be available. An optional Bose® premium audio system with Centerpoint® 2 virtual surround sound playback will bring the harmonies and vocals to life for even the most discerning of audiophiles. The system also can read email and short messages aloud while the vehicle is in motion using text-to-voice technology. Short Message Service (SMS) messages can be received and shown on the touch screen monitor. The system can then articulate the messages as well as allow users to send replies using fixed phrases. A new speech recognition system also allows users to repeat and shuffle audio tracks, as well as search and select folders. When connected with a smartphone, Twitter® and Facebook updates can be read by the system with audio responses available using the Shout function. The system also allows users to search the internet for locations and map directions. An SD card-based navigation system is optional. The long relationship between Mazda, the brand, and Zoom-Zoom, the anthem, is no secret. Jinba Ittai, the oneness between car and driver, is a long-standing brand philosophy, an essence, which is built into every Mazda ever engineered – whether for leisurely drives within the cul-de-sac community or hot laps around a track. With the Mazda3, a vehicle that is sold in more than 120 countries and accounts for 30 percent of the company’s annual global sales, this connection is even more important and made even more precise. 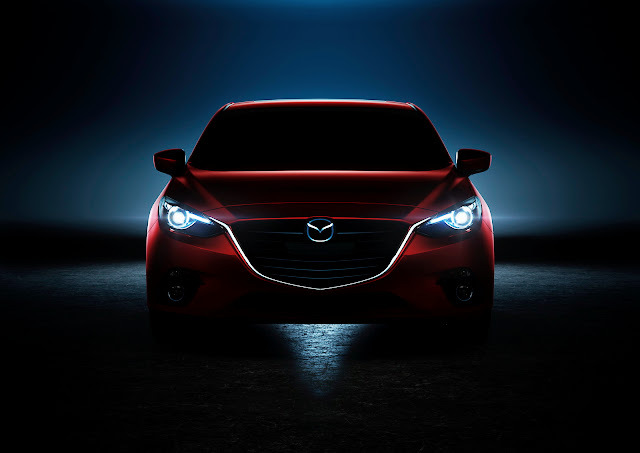 For the North American market, the 2014 Mazda3 will be offered with two engine choices: the currently-offered SKYACTIV-G 2.0-liter gasoline engine and a new SKYACTIV-G 2.5-liter gasoline engine, as fitted to the CX-5 and 2014 Mazda6. Globally, the Mazda3 offers the widest SKYACTIV powertrain line-up in order to meet local market demands, and will be available with SKYACTIV-G 1.5- to 2.5-liter-sized gasoline engines, a SKYACTIV-D 2.2-liter clean diesel engine and as a hybrid electric vehicle (Japan only). Both engines feature a new high-tumble-port 4-2-1 exhaust system that increases engine output. The SKYACTIV-G 2.0-liter produces 155 horsepower at 6,000 rpm and 150 lb-ft of torque at 4,000 rpm. As compared to the outgoing MZR 2.5-liter engine, the torque output on the SKYACTIV-G 2.5-liter engine at low- to mid-range speeds is increased by 10 to 15 percent, and its weight is reduced by 10 percent. The SKYACTIV-G 2.5-liter produces a peak of 184 horsepower at 5,700 rpm and 185 lb-ft of torque at 3,250 rpm, both figures are increases of more than 10 percent over the MZR engine. The 2014 Mazda3 will be available with a choice of the SKYACTIV-MT six-speed manual and SKYACTIV-Drive six-speed automatic transmissions. SKYACTIV-MT offers the short, crisp shift pattern reminiscent of the MX-5 Miata. SKYACTIV-Drive achieves a direct shift feel and quick gear changes that contribute to quick acceleration, while maximizing the best features of a direct-shift gearbox and a conventional torque-converter system. Mazda’s unique i-ELOOP brake energy regeneration system employs a capacitor to store electricity generated when the vehicle decelerates. Brake energy regeneration systems improve fuel economy by reducing the inherent parasitic drag of the alternator when possible, to maximize the efficiency of the vehicle under all modes of operation. Unlike other battery-based systems, i-ELOOP, its name derived from “Intelligent Energy Loop,” is the world’s first capacitor-based system to power all of a vehicle’s electrical components. 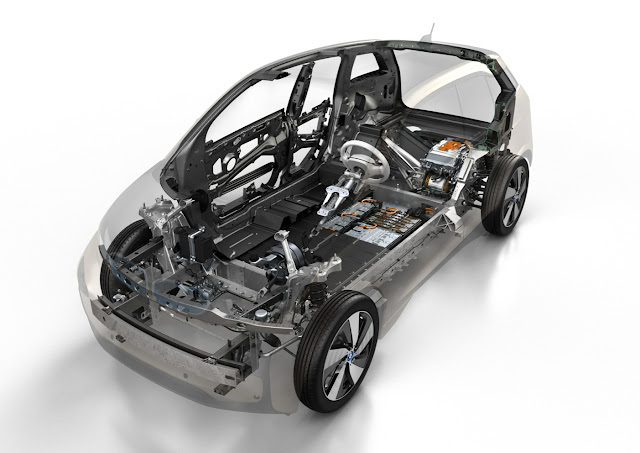 The added combination of the SKYACTIV-Body and SKYACTIV-Chassis enhances the Jinba Ittai spirit by offering high-performance, lightweight materials for added strength and safety. Carefully engineered load-transfer ensures a firm grip on the road that the driver can sense. The SKYACTIV-Body provides increased rigidity of 30 percent compared to the previous model while reducing weight as well. Although variable from market to market, the expanded use of high tensile-strength steel, and the complete reevaluation of more than 300 separate components, has led to significant weight savings. Straight line stability, tire grip and ride comfort have been greatly improved by tuning the suspension system’s springs, dampers and stabilizers. Mazda’s new mechatronic column-type electric power assist steering system is compact and lightweight, with a gearing ratio of 14.0:1. The brake response also was improved to be even more responsive, allowing for excellent vehicle control and feel as well as a braking distance amongst the best in the segment. Such improvements also reduce rolling resistance, all improving fuel economy. 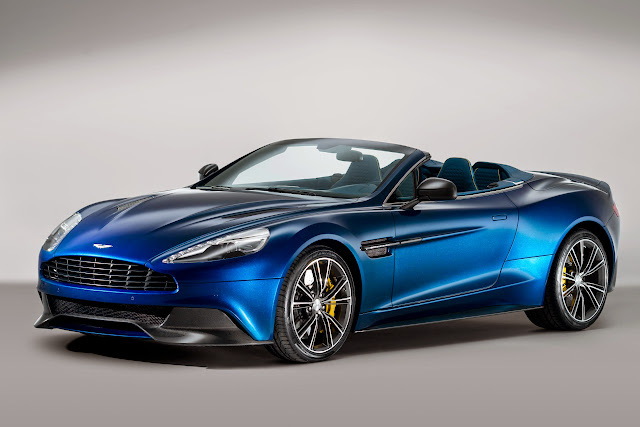 A new lightweight material that exhibits a high level of noise absorption is introduced on the dash insulator and floor mats, and insulating material also is positioned for maximum effectiveness behind the instrument panel. These measures achieve a level of cabin quietness that is highly competitive within the compact car class, and fully comparable in a class-above vehicle. 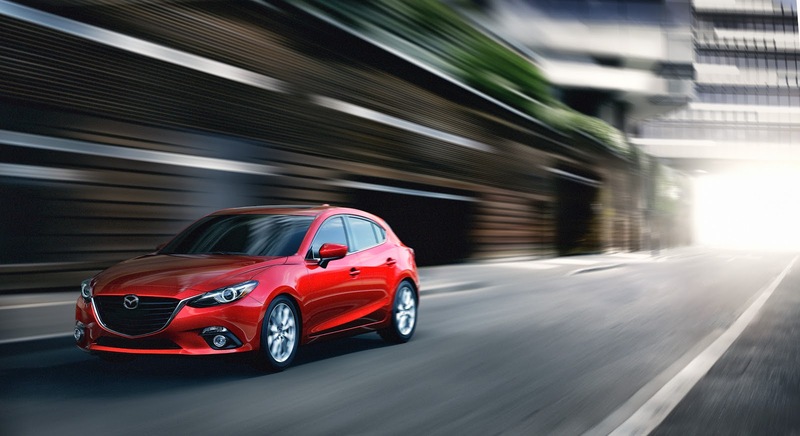 The 2014 Mazda3 introduces several all-new safety systems under the umbrella known as i-ACTIVSENSE. These technologies use sensing devices such as milliwave radars and cameras to support the driver in recognizing hazards, avoiding collisions and minimizing damage, should accidents occur. While these systems will not eliminate accidents, their intent is to minimize them and reduce the severity of a crash. High Beam Control (HBC) – The system automatically switches the headlamps between high and low beams. Blind Spot Monitoring (BSM) – This safety confirmation system detects objects located in blind-spot areas to the sides and rear of the vehicle and issues a visual alert within the outside mirrors for the driver to see. Should the turn signal be on for the direction in which the “blind” object is located, audible beeps will alert the driver. Lane Departure Warning System (LDWS) – This system monitors the lane markings on the road and issues a warning to the driver when it predicts that the vehicle is going to depart from its lane. Forward Obstruction Warning (FOW) – This system monitors the vehicle ahead and issues both audible and visual alerts to help the driver take evasive action when it determines a high risk of collision to exist. FOW operates when traveling between speeds of 9 and 92 mph. Smart City Brake Support (SCBS) – When traveling at speeds of less than 19 mph, SCBS helps prevent or minimize a collision with a vehicle. Should the imbedded laser sensor detect an object, and the system calculates there may be a high risk for collision, the brake pedal travel is reduced in order to hasten braking. Should the driver fail to perform an avoidance maneuver, the system will activate an automatic braking function. Mazda Radar Cruise Control (MRCC) – The system determines the difference in speed and distance to the vehicle in front and will automatically adjust the cruising speed in order to maintain a safe distance. Mazda Proactive Safety is Mazda’s development concept, and it aims to help the driver avoid dangerous situations before they occur by minimizing the risks that can lead to an accident. 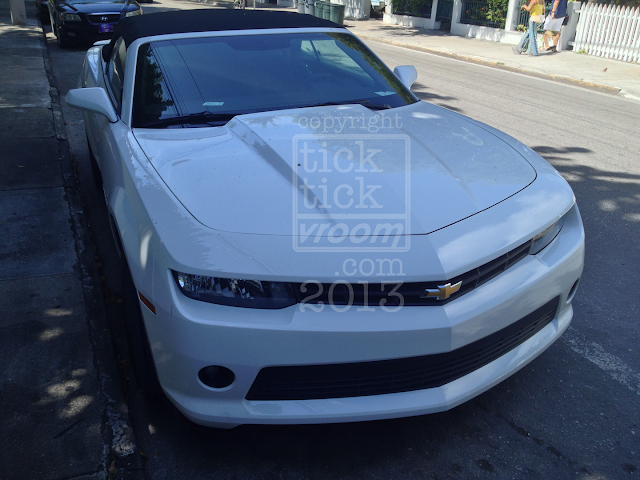 Additionally, it maximizes the range of conditions in which the vehicle can be driven safely and with peace of mind. The SKYACTIV-Body efficiently absorbs impact energy from any direction and minimizes the chance of the cabin structure being compromised. Other standard safety features on the 2014 Mazda3 include six airbags (front, side and full side-curtain), whiplash-reducing front headrests, power-assisted ventilated front and solid rear disc brakes, anti-lock brakes (ABS) with Electronic Brakeforce Distribution (EBD) and Brake Assist, daytime running lights, Dynamic Stability Control (DSC), a Traction Control System (TCS), a collapsible steering column (following air bag deployment), a trunk entrapment release system, a tire pressure monitoring system (TPMS), three-point safety belts for all seating positions, front seatbelt pretensioners with force limiters as well as Lower Anchors and Tethers for Children (LATCH). How Much Is My Car Worth after a Car Accident?